Avigdor Lieberman, the controversial right-wing politician who has frequently called for the expulsion of Palestinians from their homeland, was sworn in Monday as the new Israeli Defense Minister. The appointment of Lieberman came after the surprise firing of the previous Defense Minister, Moshe Yaalon, by Prime Minister Binyamin Netanyahu in a move that his opponents call ‘political maneuvering’, and which former Prime Ministers and other officials have condemned. 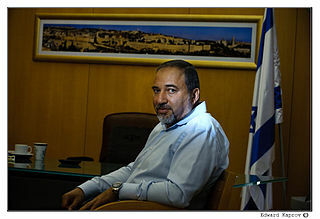 With the appointment of Lieberman, the Prime Minister was able to add the right-wing Yisrael Beitenu party to his coalition in the Israeli Knesset (Parliament), thus giving his faction a significant majority of the votes, and creating what is known as a ‘unity government’. Within the Israeli establishment, the appointment of Lieberman has sparked harsh criticism as well. Former Prime Minister Ehud Barak said that this appointment is “sowing the seeds of fascism”. The coalition that has formed in the Israeli government, which was solidified on Monday, is the most right-wing in the entire history of the state of Israel since its formation in 1948, according to Israeli analysts.